Listening to a a recent Ravi Zacharias podcast, I was overcome by a need to reiterate what the apologist shared and both simplify and unpack it further. Thus, this post. Then he returned to the man of God, he and all his company, and he came and stood before him. And he said, “Behold, I know that there is no God in all the earth but in Israel; so accept now a present from your servant.” But he said, “As the LORD lives, before whom I stand, I will receive none.” And he urged him to take it, but he refused. Naaman was a great and proud man, the General Eisenhower of his time and place, but leprosy had infected him. In time, the disease would rob him of his position and place in society, as lepers were forcibly outcast by the virulence of the disease and its horrible effects. In this era, no cure existed. A diagnosis of leprosy destroyed lives. In the Bible, leprosy exemplified the physical manifestation of the sin that bedevils all our lives. Into Naaman’s household came the lowest of the low, a little girl of foreign birth now made a slave through enemy conquest. In his desperation, Naaman listened to that pittance of a person tell of a prophet who could heal him. Interestingly, Elisha had not performed a healing miracle yet, but this girl’s faith in the God behind the prophet prevailed. How humbling to listen to a lowly enemy then go to another enemy for help. And yet Naaman went. 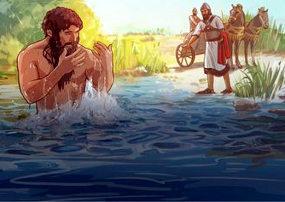 But instead of facing this opposing prophet, proud Naaman, already humbled in part by leprosy, was further humbled when the prophet sent a third-rate messenger to tell him to go wash in one of Israel’s rivers. Naaman, enraged by the slight, cried out how the rivers back home were even better than Israel’s meager Jordan . His servant pleaded, and eventually Naaman relented. And he was healed. Every person believes he or she knows what is right, yet each also knows that deep down inside, something is wrong. That wrong is sin. People try all sorts of ways to deal with that sin and its consequences in life, yet everyone fails. No. God made a way to be clean. One way. In the only waters that lived and healed. To Naaman, it all sounded like foolishness. People can try all sorts of ways to be clean: Buddha, Mohammed, self-fulfillment, self-mortification, this or that. But God made a way. One, exclusive way. That way is Jesus. The living, healing water you need is found only in Him and nowhere else. You can do what is asked by God, or you can succumb to the leprosy. But don’t say that God has not made a way. He has: Jesus. Lastly, God may be asking you to give up your pride and listen to one of those weird Christians you hate. The message of healing and life will likely come from someone you ordinarily disregard. That’s often how God works. Don’t let a superior attitude prevent you from humbling yourself long enough to heed what may very well save you. Israel was filled with lepers, but they were not healed. Instead, the God of Israel healed a Syrian enemy of Israel. God seeks out those who will believe Him, even if He must go outside the walls of the fortress to find them. Do not assume because you are inside that you will not be considered an outsider–and the outsider an insider. Naaman listened to a nobody, the least of these. And he did as he was told, even if it violated everything rational and right. He alone was healed. He alone received absolution. God will work in the lives of those who take Him at His word, and He is no respecter of persons. He used the lowest of the low to speak to the greatest. Take care in who you listen to. Take care in how you respond. Even Christians will defend an inadequate river if they proudly operate from their own wisdom and not God’s. Christians should also finish the story in 2 Kings 5, because an additional warning to us exists in the failure of one who had seen many miracles and yet did not have saving faith, Gehazi, Elisha’s own servant. The world is filled with Gehazis. Don’t assume you aren’t one of his kind or that you are better than he is. God made a Way in Jesus. One Way alone. Come, humble yourself and be made clean.